George's Bank hand-line crew. On the right a fisherman is hand-line fishing. To the left a fish is being hoisted over the rail with a gaff. In the center, cod tongues, a delicacy, are being cut out before the fish is cleaned, split and salted. 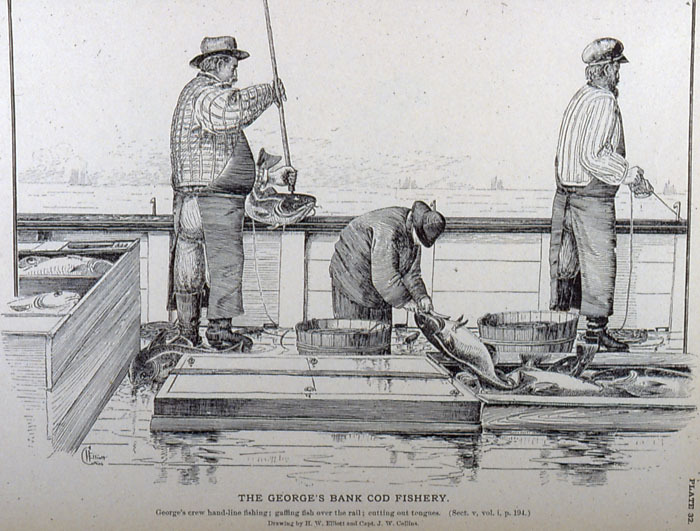 This image is from G. Brown Goode's The Fisheries and Fishery Industries of the United States, 1884-1887, Section V, Plate 32. The book can be found on line at NOAA.